“Natural disasters” – the term speaks volumes, both about terrible consequences and about the root cause. While it may seem like there is no recourse beyond one’s own insurance (and sometimes not even that) for victims of natural disasters, this is not always the truth. Although many companies in the insurance and a range of other industries would like victims to believe otherwise, the damage is often exacerbated by human acts and in some cases the disaster itself may be a hybrid, caused by both nature and man. One area in which this rings true, an area of particular concern given the recent storms throughout the West Coast — mudslides. Our Northern California mudslide lawyer wants people injured in mudslides to know that they may have legal claims against not only their own insurance policies but against a range of players whose acts may have contributed to the frightening events. Early this week, large mudslide closed sections of southbound Highway 101 in Sausalito, Marin County. A large mass of earth gave way at approximately 2 A.M. on Monday, about five miles north of the iconic Golden Gate Bridge. The mudslide left the highway littered with ten-foot boulders, chunks of soil, a tree, and even a light pole. While the event backed traffic up for miles and the San Francisco Chronicle warned North Bay commuters to expect long delays as Caltrans worked to clear the road, no one was injured in the slide. CHP warned, however, that the area would need to be evaluated for risks of additional slides. 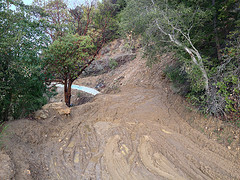 On a dedicated Landslides and Mudslides webpage the California Department of Public Health’s Be Prepared California project explains that mudslides are a subset of landslides, disturbances in otherwise stable slopes that occur when rock, earth, or other debris falls down the grade. Landslides typically follow heavy rainfall, earthquakes, volcanic eruptions, or even droughts. Mudslides in particular occur when water rapidly saturates the ground leading to a surge of water-logged earthen matter. Construction zones and areas impacted by fire are particularly vulnerable, in part because of damage to networks of tree and plant roots that help secure the soil. Landslides and mudslides cause 25 to 50 deaths each year in the U.S. and many more injuries. While you can’t sue Mother Nature, if you are injured in a mudslide, including in a mudslide-related car accident, you may have a legal claim against people and/or companies whose acts contributed to the slide. Man-made problems that can contribute to mudslides include: Poor road design/maintenance; Improperly built plumbing systems; Inadequately constructed drainage systems; Acts of property owners, developers, realtors, or their agents (ex. constructing a road or home in an unsafe area or failing to disclose information about known dangers); and Failure to take appropriate corrective steps following a slide. These claims are often complex and expert testimony can be essential. Reports may be produced with litigation in mind or may be uncovered in the discovery process. The latter, such as a report in a logging company’s files on the link between logging practices and landslides, can show causation and bolster a legal case by showing the plaintiffs knew about the possible consequences of their actions, knowledge that might even justify punitive damages. Claims against municipalities and municipal agencies require adherence to a strict timeline and special procedural rules. Cases against certain private parties may also have in-depth procedural requirements. Attorney Brod knows the law. He also has experience serving the interests of injured Californians in courtrooms and in settlement negotiations. If someone else’s negligence contributed to your being injured in a mudslide or other natural disaster, Attorney Brod can help. Call our San Francisco injury law firm to learn more.